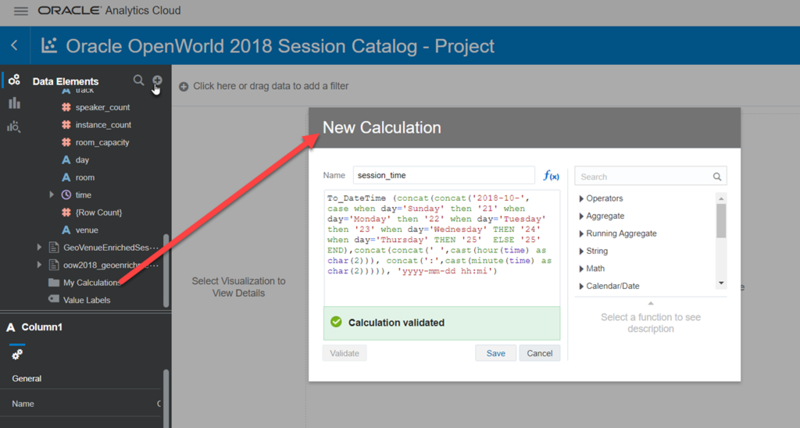 In two earlier articles on Oracle Analytics Cloud I have introduced the Oracle OpenWorld 2018 Session Catalog Data Set (First steps with Oracle Analytics Cloud – Gather, Explore, Wrangle, Visualize and Creating a Data Flow in Oracle Analytics Cloud to enriching with Geo Encoding to Map visualization of data) . A set with over 2000 session records, describing presentations at Oracle OpenWorld and CodeOne 2018. Each session has a title, a duration, is associated with one or more tracks, has a certain level, takes place in a specific room and is scheduled on a specific day and time. In the earlier articles, I have visualized some of these qualities, such as the geographical spread of the sessions visualized on a map of downtown San Francisco. In this article I will take a look at some of the date and time aspects of this data set. I want to find out what the busiest times are throughout the day and throughout the week – in terms of the number of concurrent sessions. I want to find out about evening sessions at CodeOne and I want to present a timeline of the events as the week unfolds. To show a timeline, the records need a Timestamp. However, they do not have one. The sessions have a day column with values Monday, Tuesday, etc. We know that Oracle OpenWorld 2018 took place from Sunday 21st of October until Thursday 25th of October. We know therefore how to convert the day to a real session_date. The last option seems to me to be most robust – I had some exceptions with the two other approaches – so I will apply that one. Open the Data Flow GeoVenueEnrichSessions – that also adds venues and geo coordinates to all sessions. Add a step Add Columns. Press Save and Run Data Flow. 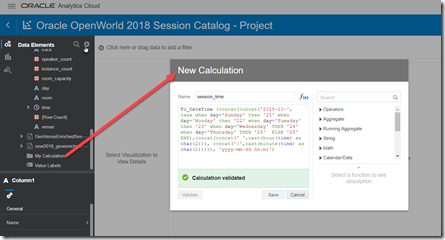 This will add the session_date column to the data set and calculate the value for each session. 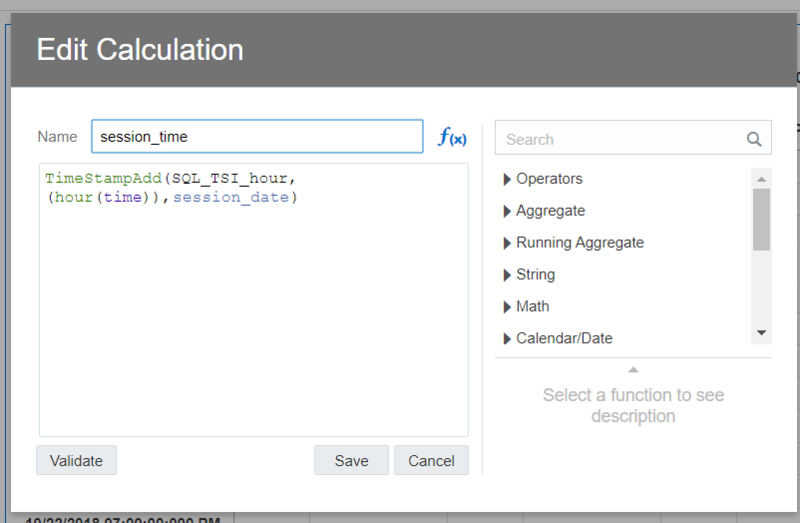 Using the new brand new session_date data element I can now create a timeline. Session_date is the category element of the timeline. Event and Row_Count are added to the picture. Now I can easily tell how many CodeOne sessions take place on October 24th: 116 sessions. 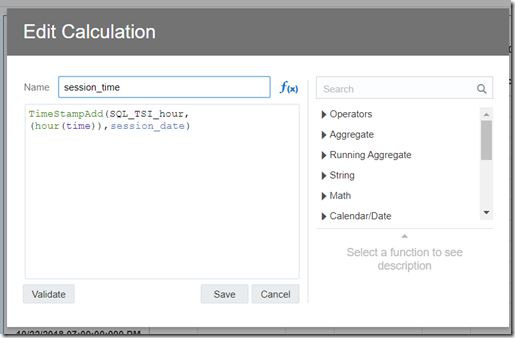 I run into issues with processing the minutes part of the session time data element. Rather than trying to fix this issue, I decide to stick to the hour component. I want to add to each session a session_time attribute that indicates the hour [slot] in which the session started. Tuesday, 12PM – with 98 sessions starting in that one hour slot. As well as lunch. In the Data Flow, create a new column called session_day_part using the following case expression that divides the rows into three groups: morning, afternoon and evening. Press Save and Run Data Flow to modify the data flow and create the new column. Clearly the afternoons are busiest, Monday is the busiest day.